The detailed budgets for six (6) local towns in Rockingham County were obtained for this study. These allow comparisons to be made with the estimated budget of an incorporated town of Massanutten. The first table below shows the general expenditures for the six (6) local towns as compared to the essential services expenditures for an incorporated town of Massanutten (as derived in Alternative T4 from Subsection 8.2 of this report). From the table, one can readily see that the incorporated town of Massanutten expenditures are on the high side compared to other towns in terms of overall expenditures and in terms of the individual categories of administration, public works, and police. This is commensurate with its road system size delineated in Section IV, number of police 9-1-1 calls delineated in Section V, and size of administration delineated in Section VII. 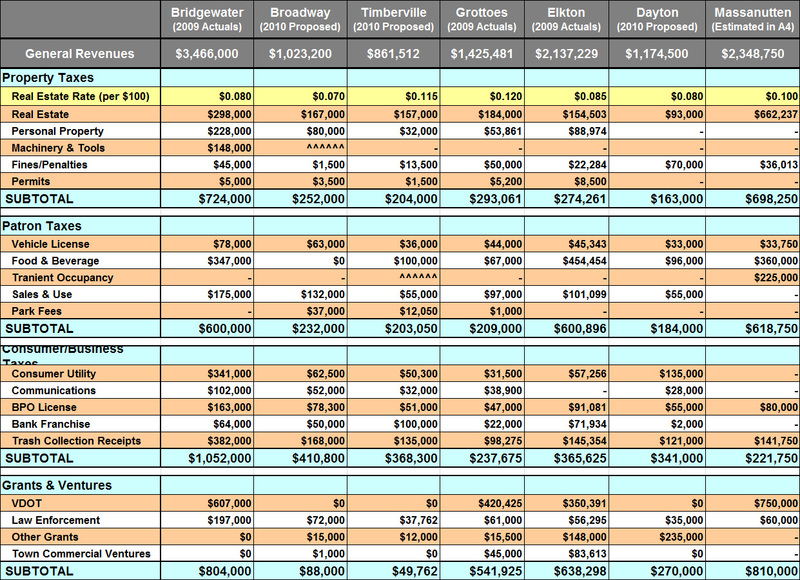 The next table shows the general revenues for the six (6) local towns in Rockingham County as compared to the revenues for an incorporated town of Massanutten (as derived in Alternative T4 from Subsection 8.3 of this report). 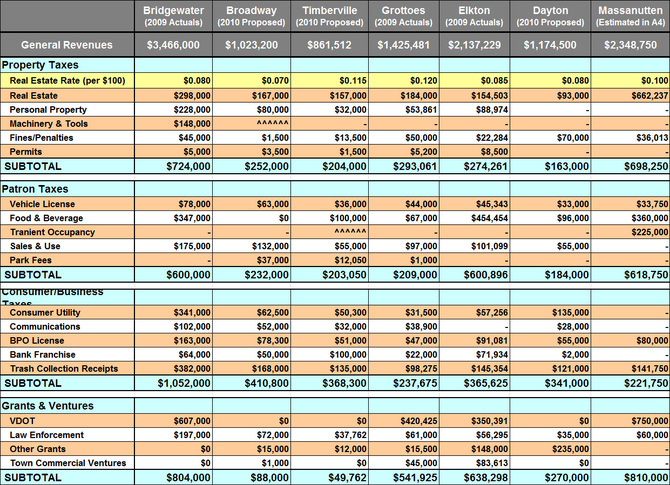 From this table, one can readily see that a real estate tax rate of $0.10 per $100 of assessed property value in an incorporated town of Massanutten is slightly on the high side of tax rates levied by the other six (6) local towns. But, it is not the highest rate. Next, one can readily see that the six (6) local towns have a balance between real estate taxes, personal property taxes, and consumer usage taxes, whereas an incorporated town of Massanutten would rely heavily on real estate taxes. However, this is an artifact of the desire in the budget analysis to have traceability of revenue sources. In reality, incorporated town of Massanutten officials may choose to have a more balanced taxation approach, similar to other towns. The large amount of revenues from real estate taxes in an incorporated town of Massanutten is also a function of the nearly $677 million of assessed property values which is significantly larger than those of the other six (6) local towns. For example, the Town of Elkton has only roughly $223 million of assessed property values. Finally, one can see that an incorporated town of Massanutten would qualify for greater intergovernmental assistance than the other six (6) local towns. This is largely due to the fact that Massanutten would have more lane mileage within its incorporated town boundaries, resulting in more assistance from VDOT. Overall, it is believed that the budget (revenues and expenditures) estimated for an incorporated town of Massanutten is commensurate with the budgets of six (6) local towns in Rockingham County. This both supports and gives credibility to the budget analysis performed in this study.